You know, I'm not even going to watch the power-mad puppet dictator give his big speech. to get bigger, stronger, will infringe more freedom, transfer more wealth, and borrow more money than exists, and do these things every year, in election years, or not. 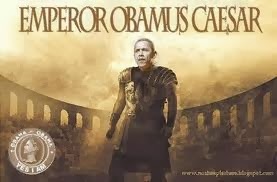 Barack Hussein Obama is, as Michael Evans of America's Voice Now says, just the finisher of a relay race toward totalitarianism; he's the guy that has the baton when the finishing line is crossed to total fascism. The race started far back in American history, certainly by 1913 when the Fed was established, probably at Reconstruction, but perhaps as far back as the first Bank of the United States. The FedGov is a monster that so far out of control that voting just changes the dressing in the windows. The real business of the FedGov--accumulating power for itself-- goes on unabated. My only prerogative is to disobey, to resist, to live my life in spite of the infringements and debasements of FedGov and its many subsidiary fascist units. My focus is to serve Christ the Lord, not Emperor Zero. My focus is to build a sustainable life for my family that exists apart from, in defiance of, and in resistance to the encroachments of the State. With all of that to do, who's got time to watch Emperor Zero's pronouncements?